Celebrating 11 years! Israeli Apartheid Week is an annual international series of events (including rallies, lectures, performances, films, multimedia displays and protest actions) held in cities and campuses across the globe. Last year was incredibly successful with over 200 cities taking part in 30 countries. IAW aims to raise awareness about Israel's apartheid policies towards the Palestinians and to build support for the growing campaign of Boycott, Divestment, and Sanctions (BDS) against Israel. Once again the Ireland Palestine Solidarity Campaign is proud to be hosting a series of events in Ireland. Unprecedented numbers of people took to the streets to protest Israel's recent massacre of more than 2,300 Palestinians in Gaza, yet most governments and many corporations continue to provide Israel with support for its crimes. IAW is a chance to speak out about Israel's most recent war crimes and all its violations of international law, as well as a way of campaigning to end international support for them. Ten years on from the launch of the BDS campaign, this year's Israeli Apartheid Week is also an opportunity to reflect on the success of the movement so far, and build for the continued growth and impact of our BDS campaigns. 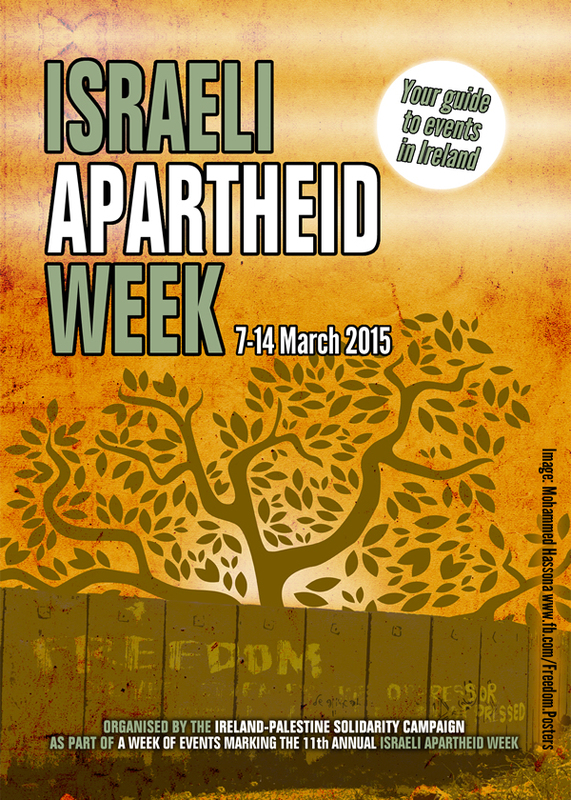 For international IAW events see the Israeli Apartheid Week 2014 website here. Below you will find a full listing of events taking place around Ireland during this year's IAW - including some events that are not organised as part of Israeli Apartheid Week, but which we think will be of interest to our supporters. We hope you will be able to make it along to some of them. 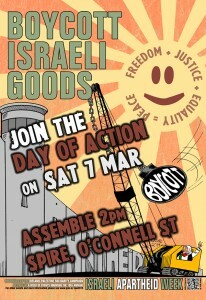 To kick off Israeli Apartheid Week, we ask you to join the IPSC Dublin branch for a Boycott Israeli Goods day of action. On Saturday 7th March, Assemble at 2pm at the Spire, O'Connell Street. From there we will visit several city centre outlets that stock Israeli goods, making consumers aware of their presence, the connection between these products and the occupation of Palestine and asking people to boycott them. Israeli exports – from both the illegal settlements and inside Israel – contribute to the economy of Israel's apartheid occupation regime and the oppression of the Palestinian people. Indeed, the Israeli government is dependent on a strong export-orientated economy and Europe is Israel's largest trading partner. Almost 200 organisations, representative of a broad spectrum of Palestinian civil society – trade unions, professional bodies such as academic unions and associations, churches, medical unions, political organisations and NGOs – have called on the international community to endorse the call for a campaign of Boycott, Divestment and Sanctions (BDS) against Israel, similar to that which helped to end the apartheid regime in South Africa. Organised by the Ireland Palestine Solidarity Campaign. 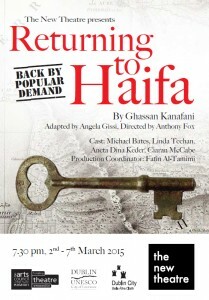 After its successful first run last November, this adaptation of one of the most iconic works of Palestinian literature is returning to the stage in Dublin between 2nd and 7th March 2015. The Ireland-Palestine Solidarity Campaign is honoured to have been able to assist in arranging a speaker for post show discussion on the Closing Night (7 March) and we encourage all our members and supporters to attend the play. Details of the speakers to be posted once details have been confirmed. The post show discussion will feature Irish human rights activist Elaine Bradley, who has just returned from 8 months in Palestine, in conversation with Irish-Jewish academic and author Dr. David Landy. The New Theatre, 43 East Essex Street, Temple Bar – BOOK ONLINE HERE or call 01 6703361 – Tickets: €15 (€12 concessions). 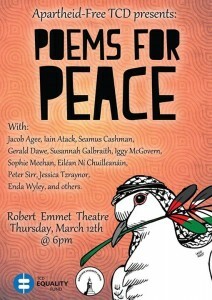 Organised by the The New Theatre, Dublin in association with the Ireland-Palestine Solidarity Campaign. 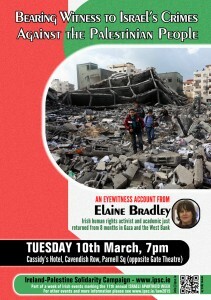 We invite you to an important public talk by Elaine Bradley, and Irish human rights activist and academic who will give an eyewitness report of Israel’s continuing war on the people of Palestine, and Palestinian resistance to these crimes. The meeting will take place on Tuesday 10th March 2015 at 7pm in Cassidy’s Hotel, Cavendish Row, Parnell Square (opposite The Gate Theatre), Dublin 1. 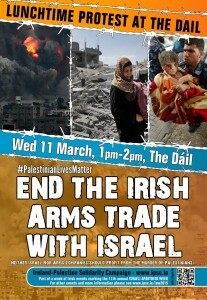 Join the Dublin branch of the Ireland-Palestine Solidarity Campaign for a lunchtime protest outside Dail Eireann (the Irish parliament) calling for an end to the obscene arms trade with Apartheid Israel, and ensuring our government know that #PalestinianLivesMatter. Neither Israel nor arms manufacturers in Ireland should be allowed to profit from the killing of Palestinians; this trade in death must end. We are calling upon the government of Ireland to end the Irish arms trade with Israel, and to advocate for an international arms embargo at EU and UN levels until Israel ends the occupation of Palestinian land and complies fully with its obligations under international law. 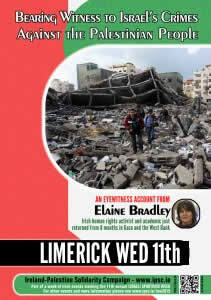 Organised by the Limerick branch of the Ireland Palestine Solidarity Campaign. As part of Israeli Apartheid Week 2015 we will be screening the documentary ‘Roadmap To Apartheid’ in the Community House on Thursday 12th March at 7:30pm. There are many lessons to draw from the South African experience of Apartheid relevant to conflicts all over the world. 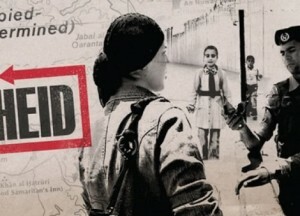 Roadmap to Apartheid explores in detail the apartheid comparison as it is used in the enduring Israel-Palestine conflict. As much an historical document of the rise and fall of apartheid, the film shows us why many Palestinians feel they are living in an apartheid system today, and why an increasing number of people around the world agree with them. Organised by the Ireland Palestine Solidarity Campaign Omagh Branch. Trade Union Friends of Palestine will be hosting a discussion on the role of the labour movement in supporting the people of Palestine. Any trade union members interested in attending please email Mags O’Brien (mobrien@siptu.ie). 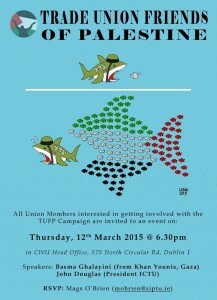 Organised by Trade Union Friends of Palestine. A Peace Reading with poets, students, and staff – reading relevant poems of their own or poems by others which have inspired them. Hosted by Apartheid-Free TCD. Readers include: Jacob Agee, Iain Atack, Seamus Cashman, Gerald Dawe, Susannah Gailbraith, Iggy McGovern, Sophie Meehan, Eileán Ní Chuilleanáin, Peter Sirr, Jessica Tzraynor, Enda Wyley and others. Organised by TCD Apartheid Free Campus campaign. 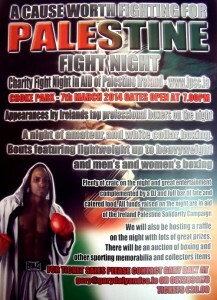 A night of boxing and entertainment in aid of the Ireland Palestine Solidarity Campaign in Croke Park on Friday 13th March. Doors open at 7pm and entry is only €20 for a full night's entertainment. Help to fund our important work and by coming to our annual night of boxing and entertainment in aid of the IPSC. Bar and DJ. Bouts from lightweight to heavyweight and women's and men's boxing. Auction of sporting memorabilia – as well as a raffle featuring some great prizes For tickets please email info@ipsc.ie or call (01) 6770253. The cost of entry is only €20 for a full night's entertainment! 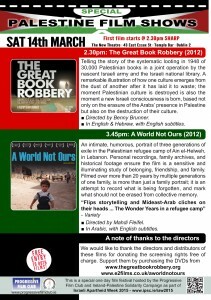 2.30pm: The Great Book Robbery (2012): Telling the story of the systematic looting in 1948 of 30,000 Palestinian books in a joint operation by the nascent Israeli army and the Israeli national library. A remarkable illustration of how one culture emerges from the dust of another after it has laid it to waste; the moment Palestinian culture is destroyed is also the moment a new Israeli consciousness is born, based not only on the erasure of the Arabs’ presence in Palestine but also on the destruction of their culture. Organised by the Progressive Film Club in association with the Ireland Palestine Solidarity Campaign. To mark International Israeli Apartheid Week, we will be leafleting and collecting signatures on a national petition against the Irish arms trade with Israel. Please join us if you can, we're starting in O'Connell Square, Ennis at 12 noon on Saturday 14th March. Ireland has bought €14.7m worth of arms and military components from Israel over the last decade, while Irish-based companies have exported €6.42m worth of military and 'dual use' hardware to Israel since 2011. Meanwhile, Israel has killed over 9,000 Palestinians, including 2,060 children since 2000. Military items exported from Israel will have used Palestinians as 'human test subjects' so such weapons can be marketed as 'battle proven'. Any military components exported to Israel will be used to kill and maim yet more Palestinians and to entrench the decades-long military occupation. Neither Israel nor arms manufacturers in Ireland should be allowed to profit from the killing of Palestinians; this trade in death must end. We are calling upon the government of Ireland to end the Irish arms trade with Israel, and to advocate for an international arms embargo at EU and UN levels until Israel ends the occupation of Palestinian land and complies fully with its obligations under international law. We hope to see you there. The Ireland-Palestine Solidarity Campaign was set up in 2001 by human rights and community activists, academics, journalists and trade unionists. In partnership with Palestinians living in Ireland the IPSC was formed to provide a voice for Palestine in Ireland. We are an independent, human rights and political advocay organisation, run by volunteers all committed to a just and sustainable peace in Palestine and Israel. We are funded solely by our membership fees, standing orders and donations.